He began his studies with B.K.S. Iyengar at the age of 7 and was the youngest person to be awarded the Advanced Yoga Teacher’s Certificate from Iyengar at the age of 22. He has been training yoga teachers in India, Asia, Europe and the United States since 1976. Aadil writes for Yoga Journal Magazine and been an “Asana Expert” for both the magazine and website. He is frequently a keynote speaker internationally. Aadil is the author of three Teacher Training manuals and Fire of Love, the book that seeks to restore the essence of yoga. Aadil is a Certified Shiatsu and Swedish Bodyworker and a Clinical Hypnotherapist and has extensively studied alternative health and Ayurveda. 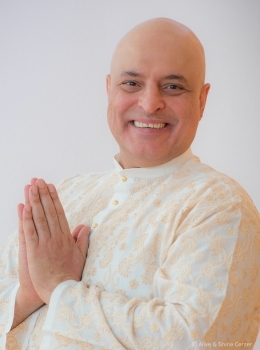 Aadil is the co-founder and co-director of internationally-renowned Alive and Shine® Center in Bellevue, Washington and Purna Yoga College®, a 200-hour, 500-hour 2,000-hour, and 5,000+hour Teacher Training program. We practice and practice and we feel good. Yet so often, our lives do not make huge shifts for the better. Is the practice designed to solve all life problems? Are we missing something in our practice? Is there more that we must do? Answer these powerful ques-tions with Aadil as you spend a day learning where your practice has holes and leaks and how yoga is designed for true joy and freedom. Props: Sticky mat, belt, block and one blanket You will learn: ·	How to balance your asana practice with active and restorative poses. ·	How intention and mental focus are the secret behind the practice. ·	Small and powerful lifestyle changes that will bring the joy of yoga into your life. ·	What zaps your energy. ·	What gives you energy. In the practice of asana the most powerful detoxers are twists and backbends. Learn Purna Yoga twists, which wring out the toxins from your digestive system and make you feel more alive. Twists also revitalize the energy of your spine and you are as young as your spine. The sacrum and the pelvis are designed to be sources of power. Asana often cultivates only the masculine aspect of this power. Learn how the asana practice of Purna Yoga™ balances power with humility, the masculine with the feminine. Emphasis on standing poses, twists, backbends and relaxation.